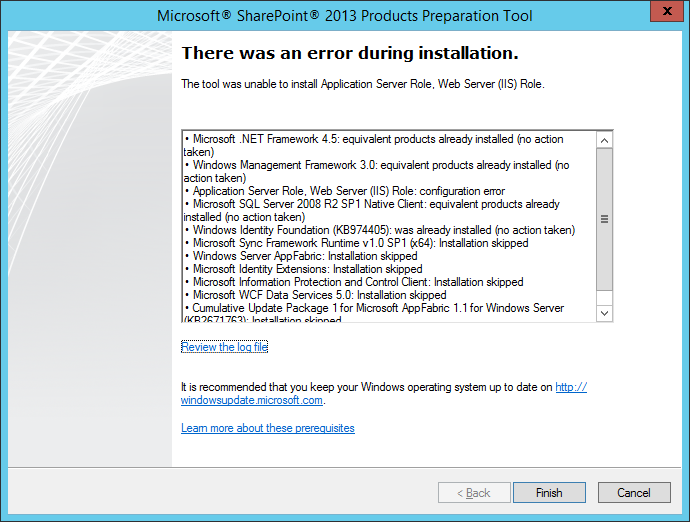 Problem: SharePoint 2013 Products Preparation Tool failed with an error "There was an error during Installation - The tool was unable to install Application Server Role, Web Server (IIS) Role." during prerequisites installation in Windows Server 2012 R2. Solution: Mount the Windows 2012 R2 ISO into the drive and Install the roles offline from Windows Server Installation disk. Where E:\ is your DVD drive. Copy "C:\Windows\System32\ServerManager.exe" and rename as "C:\Windows\System32\ServerManagerCMD.exe"